HOLMDEL, N.J. (CNS) — Students at St. John Vianney High School expected their recent pep rally to be fun, colorful and filled with good-natured competition. But they were completely taken by surprise during the pre-Christmas celebration when six priests ran out onto the basketball court for a friendly exhibition game — all with the intention to teach about vocations. 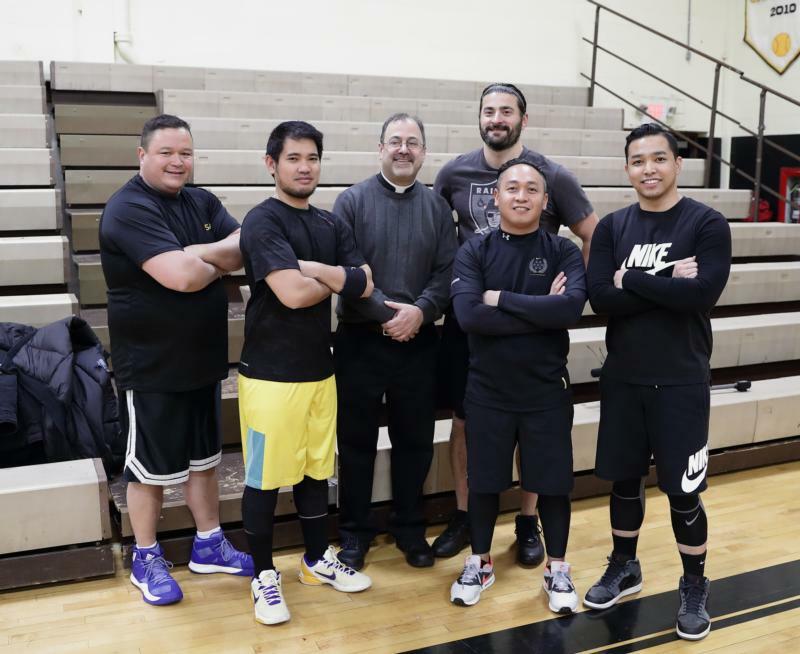 The basketball game was a way “to reach out and let them know that priests are approachable and they, too, can enjoy hobbies,” said Father Michael Wallack, priest secretary to Bishop David M. O’Connell of Trenton and diocesan director of vocations. “Most people don’t really know what a priest does during the week besides writing a homily,” said Father Wallack, who was joined on the court by Father John Michael Patilla, parochial vicar of St. Benedict Parish, in Holmdel and chaplain in St. John Vianney High School; Father Augusto Gamalo, parochial vicar of St. Gregory the Great Parish in Hamilton Square; Father Thomas Vala and Father Gregg Abadilla, pastor and parochial vicar, respectively, of St. Clement Parish in Matawan; and Father Dean Gaudio, pastor of St. Elizabeth of Hungary Parish in Avon-by-the-Sea. It didn’t take long before the game between the St. John Vianney Lancers and the priests, who called themselves God Squad II, went from being a friendly game of hoops to a competitive match that resulted in a 4-2 win for high schoolers. The diocesan communications staff produced a video of the game. Also evident in the video and in comments following the game was the strong camaraderie between the priests as they reflected on how basketball could serve as an effective vocation recruitment tool. “Sports is a good avenue to promote vocations and meet kids where they are at,” Father Patilla said. The priests enjoyed sharing a bit on how they prepared for the game with Father Gamalo saying “there’s some prayers involved,” especially because the priests did not have the opportunity to practice beforehand. Listening to upbeat music and watching games on television helped to motivate Father Gamalo and Father Abadilla give their all to the game. Father Gaudio smiled as he shared how he thought the goal of the game was to show students that priests “are not all 70 years old” and can be everyday men who like sports. “I would like to think there was a young man in today’s crowd who might be thinking of a vocation to the priesthood, and our appearance at the game got him thinking about it even more,” said Father Gaudio, who used to play basketball for Bound Brook High School and on an intramural team in St. Bonaventure University. Father Vala said he hoped that through activities such as sports or music, the students can get to know a priest and share a friendship with him. And through that friendship, he hoped students would feel comfortable approaching a priest when thinking about the priesthood as a vocation. “The priesthood is a vocation to serve God, and in doing so, you touch the lives of others when you reach out to them and make a positive difference in their lives,” he said.